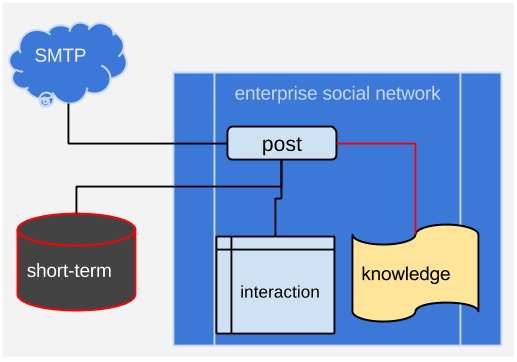 Enterprise Social Networks (ESN) are usually considered as a mean to gather the corporate knowledge that is dispersed in the people’s head, or in mail/documents threads. the user (or someone else, an ESN editor), further classify (using tagging, grouping or other ESN features), the content that contains knowledge. Now, the knowledge-bearing content is available to everyone. Where is the limit? In user actions. This pattern assumes that the single user is willing to spend some effort in publishing/reviewing/classifying content. But we forget that this is not his job. Imagine a salesperson, in hurry, trying to close an important deal. How much do you think that he will be committed in leaving a knowledgeable trace that that particular kind of product requires a specific customizing in order to be successful for a particular kind of customers? Maybe he will do it later? With an inbox receiving hundreds of email each day? This is why sometimes user adoption for ESN projects is limited, and adding a “training/sponsoring” track to the project is not enough. Here, the Enterprise Social Network software includes the inbox features. Incoming mail appears immediately as a new post on the user’s dashboard, classified in the proper thread. If the message contains short-term content (i.e. “John is coming late at the meeting: he will arrive perhaps 10:30”), it will remain in the user inbox, and will be deleted lately. There is still the need to select and classify content that is relevant for the corporate knowledge-base, but this action will be easier if the content is already classified in the context of the ESN. A step in this direction can be seen in Zimbra, or in the last Inbox by Gmail development. But I expect that this will be a significant development for the most popular ESN products.